Looking for tranquillity and inner peace to put a 'spring' back in your step? With Spring in the air and the ocean still just a tad cold, we need to find some other options to fill our days until our sun-baking days arrive (yes, I know sun-baking nowadays is a big no-no, but I'm sure many of us still love our daily dose of Vitamin D). The Sunshine Coast has so much to boast about - not just the stunning scenery, we have the mountains AND the beach, but….did you realise we have some fantastic gardens/parks in and around the area as well? Spring is ideal for venturing out (while we await the onset of summer and languishing on the beach) to discover what's on offer in the way of tranquillity and long, slow ambles to discover the natural fauna and flora that abounds in these lush gardens. I have found six jewels - some well known, others not so well-known - in and around the Sunshine Coast. A short drive from the hinterland town of Cooroy (a very charming little town, and well worth a stop for a cup of coffee or a browse of the funky little shops to enjoy the village-like atmosphere) on the shores of Lake Macdonald. Eight hectares of native and exotic plant species, these stunning gardens are home to an abundance of wildlife. Other unusual features of this beautiful area include: an open-air bush chapel; a fern house; a lily pond; large lawn areas ideal for picnicking; plus a Greek-style amphitheatre, overlooking the Lake - an ideal venue for concerts at the lake! One cannot believe that this beautiful area used to be farm land. Another of our best-kept secrets, these beautiful gardens are surrounded by rainforest and views to the Glasshouse Mountains. Offering over six kilometres of walking paths, one can wander around and admire the multitude of different plant varieties, ranging from roses, azaleas and annuals to some of the rarest cycads in the world. Picturesque lakes and waterfalls provide wonderful opportunities for taking some great photos. A perfect place for an outdoor wedding in the gardens…. This is definitely one of my magical places - I do return here again and again - set on 112 hectares of natural bush, creeks and lagoons, Maroochy Bushland Botanic Gardens offers a number of short walks, giving you an opportunity to fauna 'spot', whether it be a possum, koala or even a water dragon. As mentioned in a previous article of mine, Maroochy Bushland Botanic Gardens has an exquisite Australian fauna Sculpture Garden, an absolute delight to meander through. With plenty of grassed parkland to sit and picnic, undercover picnic areas, this remarkable Botanic Gardens is a firm favourite with families and I can fully understand why. Unfortunately, no furry family members are allowed. Hidden on the northern side of Buderim, less than a kilometre from the Buderim Village, Buderim has its own secluded oasis: a rainforest world of tall trees, ferns and water cascading over rocks down to a stunning water pool, a firm favourite with locals to cool off. A fantastic walking trail has been developed from two entry points:- the lower entry is off Lindsay Road via Harry's Lane and the second entry point is via Quorn Close - both these entrances have ample parking so a 'park and explore' is really easy. Initially on entering at lower Lindsay Road, your first views are a massive park with barbecues and picnic tables. As you continue along the short loop road, you will find the elevated wooden boardwalk - this boardwalk is great for littlies, disabled walkers and wheelchair users to enjoy the natural surrounds. This well-maintained boardwalk becomes a fairly rugged trail so again sturdy shoes are a good idea, but ultimately comes out at Serenity Falls, the pearl in the oyster. The entry via Quorn Close is a shorter, slightly rugged walk to reach the Falls and doesn't have the boardwalk facilities. As this is a nature reserve, unfortunately no pooches! In Queen Street, Caloundra, Ben Bennett Bushland covers nineteen hectares of beautiful natural bushland where you can explore a number of different eco-systems including eucalyptus, heath and rainforest systems as well as the rare coastal lowland vine forest. Ben Bennett Bushland Park offers self-guided walks ranging between 800 and 1100 metres. Spring is definitely the season to visit this park - maps are available at the Queen Street entrance. 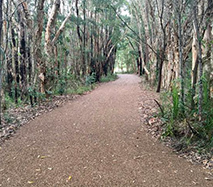 The Sunshine Coast Council have upgraded a walking track making it easier for people to access the Park, providing a smooth access to the small observation deck and boardwalk, which surrounds the pond inside the reserve. A great place to study the beauty of the wildflowers, bird watch or just sit back and enjoy an hour or two of solitude on secluded seating, which is provided throughout the reserve. The good news is that Ben Bennett Bushland Park is doggy-friendly, so our furry family members are welcome too - what better way to enjoy a lazy afternoon stroll with our four-legged friends. Welcome to the natural jewel of the Sunshine Coast Hinterland! 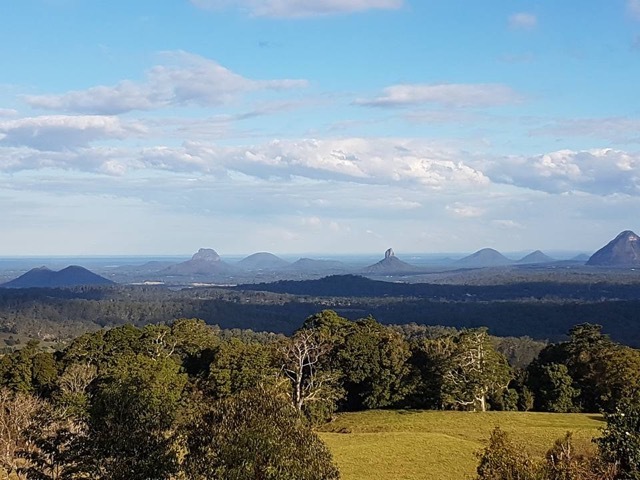 Mary Cairncross Scenic Reserve is 55 hectares of sub-tropical rainforest overlooking the Glasshouse Mountains National Landscape - a truly beautiful sight! A remnant of the rainforests that once covered the Blackall Range, this Reserve is a living museum of diverse plant and animal life which will absolutely delight you. Take a relaxing amble along the rainforest trails between 7.00am and 6.00pm - a gold coin donation is appreciated - and enjoy all that this beautifully scenic area has to offer. Picnic (plus sheltered picnic spots) and barbecue areas are all available to the public as well as wheelchair and stroller friendly walking tracks. Why not make a family day of it - a children's playground and open recreational spaces ideal for ball games, make this a fantastic day out - and only approximately one hour's drive north of Brisbane in Maleny. Gongrats on a beautiful article and winning a prize. Well deserved, cheers Marie.